One of them is sonar, available in Nettigo. 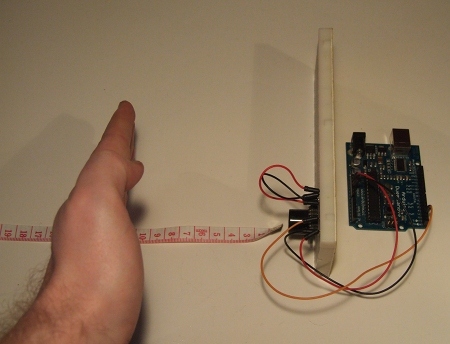 This sensor measures the distance to an obstacle using ultrasound (sound with a frequency about 42 kHz, what is greater than the upper limit of human hearing). Normally, this is used in alarm systems (unlike passive infrared systems there is possible to set the trigger distance) and in parking sensors. Installing it into your robot will let you know, how far are obstacles from the robot or make something like environment map. Maximum distance detected by the sensor is 255 inches (6 meters) with 1 inch (2,54 cm) resolution. Soundwave beam width of “raw” sensor is about 24 inches (61 cm). The smallest distance sonar detects is 6 inches (15 cm). EZ1 sonar has quite a few terminals, but you shouldn’t be afraid of their amount. Most of them are for your convenience. The first two (GND and +5) are for powering the sensor. We connect them to their equivalents on Arduino. The remaining terminals provide variety of signals representing detected distance. Analog distance signal is available in the sensor on pin marked as “AN”. We can connect this pin to one of Arduino’s analog inputs and read it with “analogRead” function. Datasheet says, the voltage on “AN” increases by 9,8 mV with each inch of distance. As you know from previous posts, I reccomend manual compensation, which I will describe later. Another useful output of the sonar is pin marked as “PW”. This output uses so called PWM (Pulse Width Modulation). It means that width of “HIGH” impulse increases with distance. Arduino has a ready to use function for this occasion, called “pulseIn”. 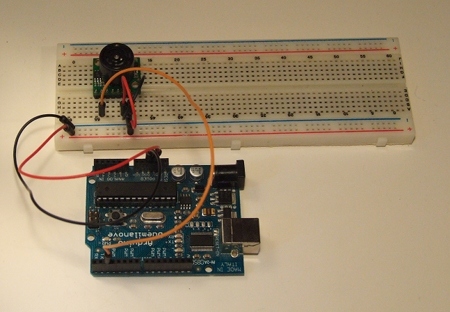 It’s first argument is number of Arduino’s digital pin, on which we measure the impulse width. The second argument is type of the impulse we measure – “HIGH”, or “LOW”. The function returns duration of the impulse in µs. It also prevents our program from beginning the measurement in a wrong moment – it waits for the next impulse to begin. Datasheet says, that the width increases by 147 µs with each inch of distance. Involves sending information (numbers) with a single wire. The numbers are sended by bytes – 8-bit packets. Bits are sended one by one from the first to the last. Two additional bits are sended also. In the beginning – start bit, always 0 (LOW). It indicates beginning of the transmission. At the end – stop bit with 1 value (HIGH). It provides correct recognition of the end of the transmission. If we aren’t sending anything, HIGH value is set to distinguish beginning of transmission from absence of transmission with start bit. Asynchronous transmission lies in the fact that transmitting device doesn’t inform, when the transmission begins. It’s defined by calculating transmission speed – how many bits we are about to transmit in one second (including additional start and stop bits). Transmission speed unit is baud. Sonar’s serial signal would perfectly fit to the standard (digital pins 0 and 1 – Rx and Tx), if it wasn’t inverted. Inverted means, that its impulses are inverted. When the receiver expects logical 1 (HIGH value), it picks up logical 0 (LOW value). This signal we can observe with computer in “Serial Monitor” connected to Arduino IDE software, but we have to invert the signal. This can be done with “NOT” logic gates from irreplaceable “UCY 7404”. NOT gate has one input and one output. It gives on its output value opposite to this on input. Second step is to remove processor from Arduino, as it excludes signal conflict between it and the sensor, which might cause errors. This is what exactly the sonar returns through serial port. The first letter “R” is a header which indicates beginning of data packet to separate and recognize every distance. The next 3 characters represent distance in inches. The maximum distance is 255 inches. Last character is binary value 13, called “CR” in ASCII table or special character “\r” in C language. For handling serial port we can use yet another two sensor pins. The first is “RX”. Logic dictates it’s serial data input (by contrast to “TX” – output). But in the sensor using of this input is simplified. It serves to turning distance measurement on or off. The sensor measures distance and transmits it through “TX” when “RX” is unconnected or in HIGH state. When “RX” is in LOW state, the distance isn’t measured. The duration of HIGH state on “RX” input must be longer than 20 µs for correct measurement and data sending. The last pin is “BW”. Setting it in HIGH state causes sending impulses corresponding to “0” binary value. 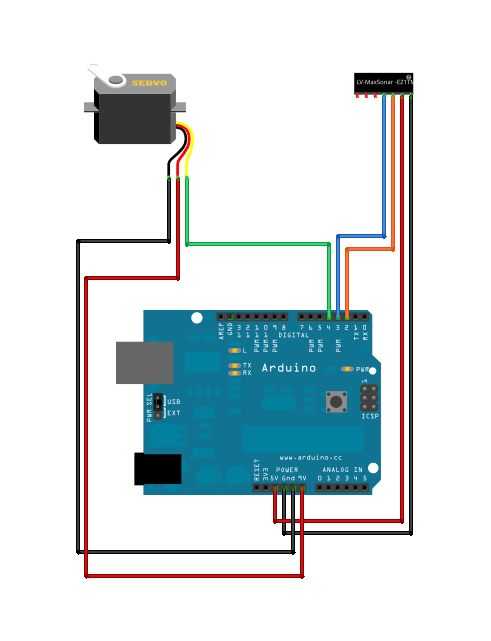 Of course this output serves for using its data in Arduino, not in computer. We have two possibilities. 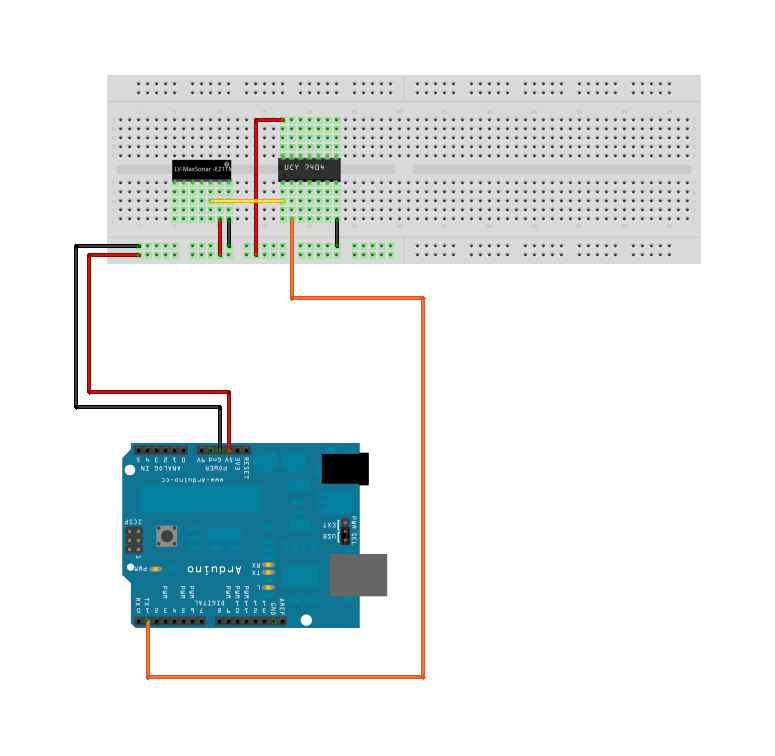 If we won’t be using USB port in our project, we can connect “TX” output through “NOT” gate directly to pin 0 (“RX”) in Arduino (in Arduino Mega there are also two additional serial inputs, that could be used despite of using USB) and use “Serial” object in program. However, implementation of additional elements is inconvenient and complicated. In Arduino software there is also “SoftwareSerial” library, allowing operating on serial data on any digital pin. But it doesn’t handle inverted signal. Thus, I let myself to expand it with extra “nread” method, which reads inverted signal. It will allow to read data from the sensor easily, without any additional elements. Unfortunately “SoftwareSerial” has also certain weak points. The most important is that the function isn’t asynchronous. This means, that we have to wait fot the sensor to send data to us (“read” and “nread” methods are blocking whole program until the data is read). There’s no way to check (like with hardware port using “Serial.available” method), if any data is waiting for us. Happily, there is one more library – “NewSoftSerial”, which is free of these defects and, in addidion, handles inverted serial signal. The first two measurement methods (analog and impulse) require callibration (because of electrical resistances and delays in program). It needs to check what values are returned by distance calculation functions for certain distances, and after that, using previously described “map” function, convert them to our units. For callibration, there is tailor meter or long ruler needed. We direct the sensor sideways and place the ruler on its way. The edge of sensor’s casing should be aligned with zero point on ruler’s scale. Next, we put hand on the scale, in “field of view” of the sensor (farther than 15 cm). After that, we move our hand even farther and write the values down. Because the values are changing with every inch (2,5 cm), it’s better to place another obstacle in boundary points (where the value changes) to increase accuracy. The wroted values should be placed in program’s code as definitions. “CM0” and “VALUE0” are the first distance and value returned from the function, “CM1” and “VALUE1” are the next. A good example of taking advantage of the sonar is “radar”. I mean, device which will make a map of obstacles in its surrounding. In your project, this could be useful to route planning (searching for ways, terrain orientation based on specific points). 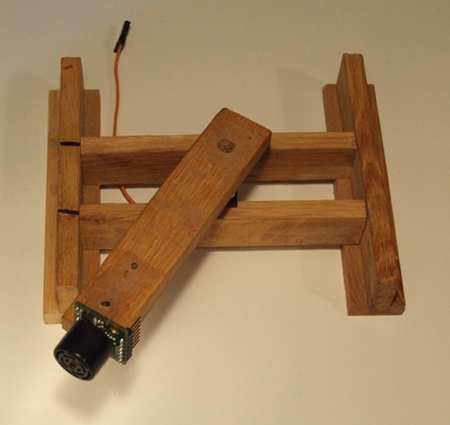 For turning the sensor I used a model servo. Servo is a device consisting of: motor, a few gearboxes and some electronics. This creates a quite strong drive (depending on type, about 1 kg on 1cm of the lever). The thing, that distinguish the servo from regular motor is ability to set a specific angle of its axis (from 0 to 180° range). This property is used in RC models to, for example, moving steers. We have certainty, that by sending specific signal, the steer will be in desired position. Servo usually has three wires. Controlling the servo is easy. 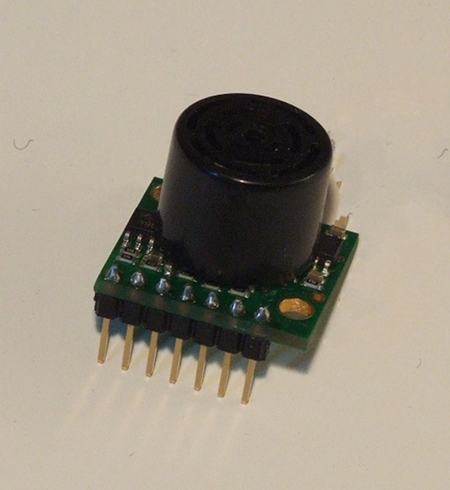 It’s to provide controlling signal from any digital pin. Controlling signal are PWM impulses, whose width determines the angle servo’s axis should be turned. The standard is: 544 µs – 0°, 2400 µs – 180° angle. 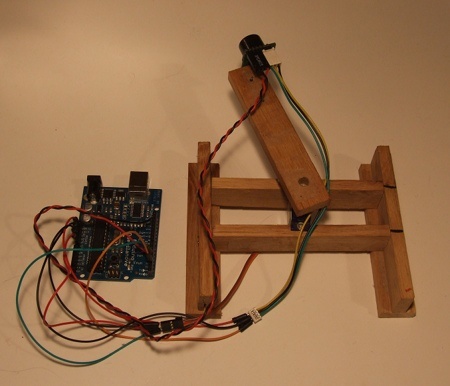 There is another trick – the bigger is the break between two impulses, the slower servo turns to desired angle. The same rule affects how strong it works and holds position. 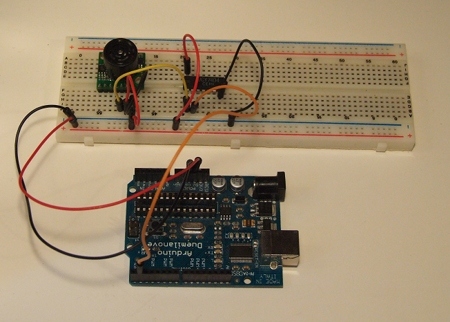 In Arduino project there are a few servo control libraries included. The built in one, Servo is good for basic operations, but has a certain disadvantage. 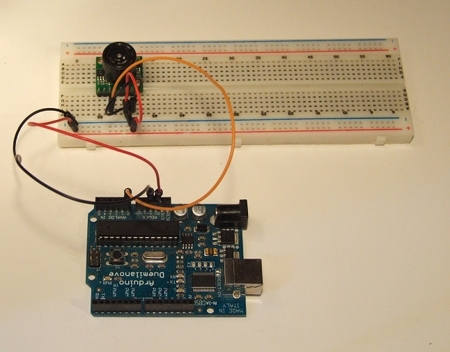 It uses hardware timer of Arduino processor, which is also used by software time counter. With this library, you are unable to use such functions as “delay” and “millis”. 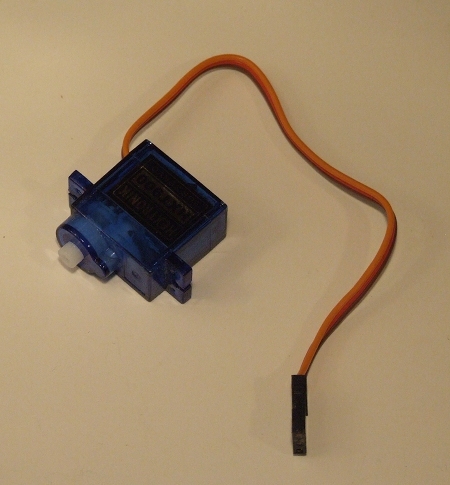 It’s better than ordinary Servo, because doesn’t disturb other functions. Next disadvantage, which can also be advantage is neccesity to evoke “SoftwareServo::refresh()”, responsible for generating impulses, ever and again. The advantage is of course full control over strength and speed regulation (dependant on frequency of evoking it). Radar’s electrical structure is based on connection from sensor’s serial output to digital pins (PIN2 – sensor TX, PIN3 – sensor RX). The controlling signal is wired to digital pin4. Power supply of the servo should be max. 6V. Thus, if we are powering Arduino with such a voltage or from USB port, it’s good to power the servo from “Vin” pin. For communication I used USB port, normally utilized for programming Arduino. 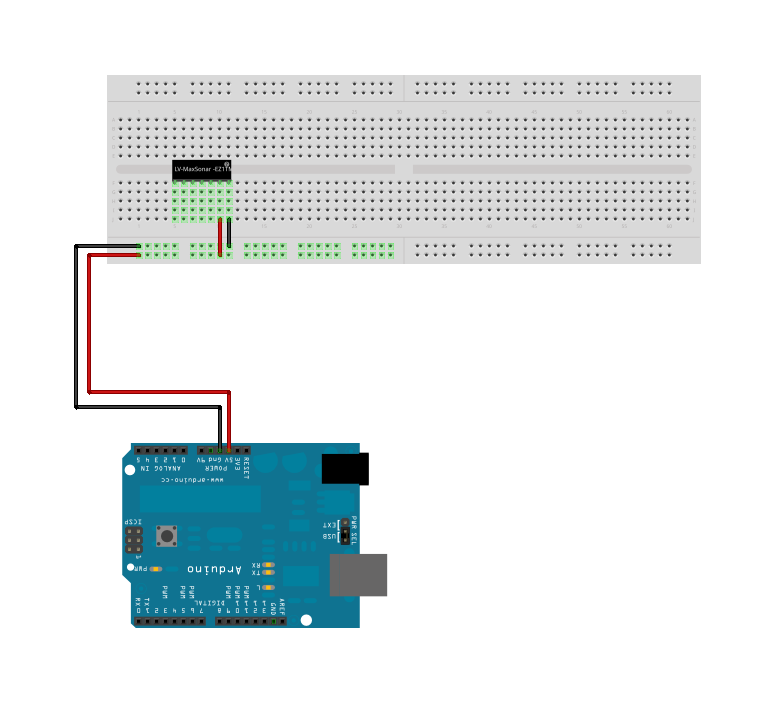 This port is connected to serial input/output (pin 0 [RX], receiving data from USB, pin 1 [TX] – sending data to USB). For ths transmission abovementioned “Serial” object is responsible. I decided to write similiar function, basing on this object. Rnnn\n – Chooses the angle to turn the sensor. Instead of “nnn” the angle in degrees (three digits, eg. 175, 032 or 005) should be written. D – In response for this command the distance to a obstacle will be returned. Format of this response is “Dnnn\r\n”, where “nnn” is distance in inches. The way program works needs some explanation. “NewSoftSerial” library, like “Serial” object exerts asynchronous data loading using buffer. This means serial data is downloaded to special memory area, in which it waits for receiving. The amount of data in buffer could be monitored with “available” method. The program doesn’t clutter the buffer with outdated distance data. So, when you don’t download data with “D” command, the program automatically blocks data sending through pin3 (sensor RX) and cleans the buffer with “clean_buffer” function. For data processing in the computer I used Python script language. Communication with Arduino is provided by “PySerial” module. 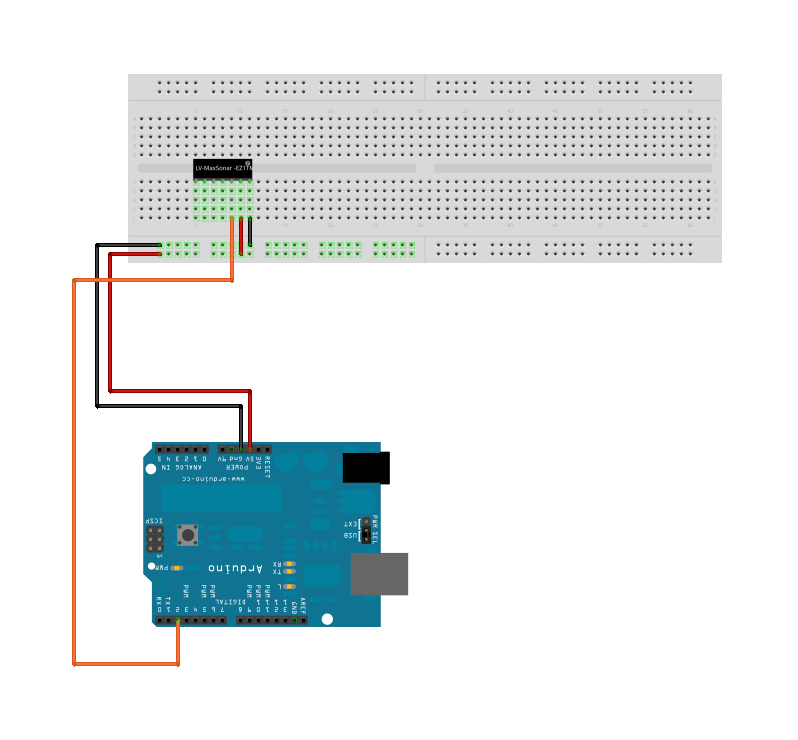 To prepare communication with Arduino “serial” module should be imported and “Serial” class object prepared. The first argument is serial port device file. Its name complies with setting in Arduino IDE (menu “Tools > Serial Port”). Under Windows it will be “COMn”, where “n” is proper serial port number. The next argument is time for “read” method to wait for data. The result of this part is “radar” object, on which we perform read or write from assigned port operations. In “distance” variable” text string “Dnnn\r\n” containing the distance (in “nnn”) should appear. Far more comfortable is receiving data with “readline”method. It reads data series until new line character (“\n” or “\r\n”) comes. As a result, in “distance” variable distance in centimeters appears. 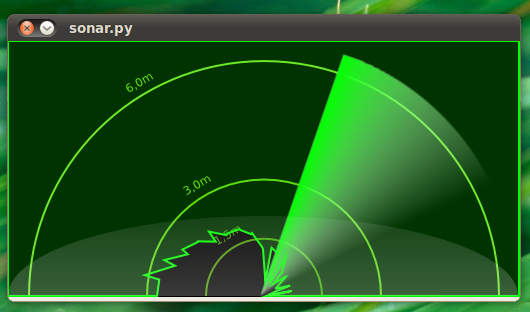 To attractive present radar idea I decided to write a program simulating its work. I used abovementioned Python language and its modules PyGTK, Cairo and Serial. To work in Ubuntu it needs only “python-serial” packet to be installed. Under Windows necessary exe/msi packets can also be collected: python, pygtk, pyserial. For easier understanding the programs haven’t complex error handling procedures. However, such a handling could be easily added.